In 2012, Russians took more than 250,000 trips to the U.S. – a 15% increase over 2011, which itself was a record-breaking year. Almost one year ago today, I was celebrating the selection of the U.S. as the “dream country” according to an online poll of Russian travelers conducted by respected travel web site Travel.ru. In the year since that announcement, the U.S. Embassy, especially our U.S. Commercial Service and Consular Section, has worked hard to ensure that more Russians have the opportunity to experience the U.S. first-hand. Our efforts have paid off. In 2012, Russians took more than 250,000 trips to the U.S. – a 15% increase over 2011, which itself was a record-breaking year. 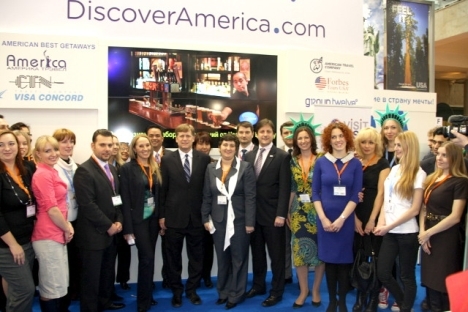 A great deal of the credit for our success goes to our excellent partner in travel – VisitUSA Russia. This group works closely with the Embassy to help travelers understand that the process for obtaining a U.S. visa has never been easier and once you get that visa, you can travel to a country with endless business, cultural and leisure possibilities. In September, I hosted an event in the consular section of the U.S. Embassy in Moscow where we provided over 100 travel agents with tours of the visa waiting area to explain to them the improvements we have made to the application process. These travel agents experienced first-hand how quick and efficient the process is and can now explain to you how obtaining a visa should not be seen as a barrier to realizing your dream vacation in the U.S.
An easier visa application process and the draw of travel to the U.S. made last year another record year for the issuance of business and tourist visas in Moscow. We issued 25% more than 2011 which also broke all previous records. We are on track to breaking that record again. At all of our posts in Russia we issued over a quarter of a million nonimmigrant visas of all types. Business/tourist visas are now cheaper than before and valid for a longer time. More Russians are eligible to receive a second visa without appearing in person than any time. However, plan well in advance because visa demand is extremely high – 30% over this point last year, so the “virtual” queue may be a bit longer than you anticipate, especially during the summer months. Our travel partner, Visit USA has also been active in training Russian travel agents and tour operators on some of the most attractive travel opportunities in the U.S. This online training, conducted through a series of webinars, focused on different areas of U.S. travel such as national parks, ski resorts, beach vacations, airline transportation, meeting and incentive travel, attractions and theme parks for family vacations, and the romance of cruise travel in the U.S.A. While attending the Moscow International Travel and Tourism Expo (MITT) I had the honor of meeting the travel agents who have gone through this training to become experts in U.S. A. travel. These travel agents are supported by VisitUSA Russia and our new national tourist office, BrandUSA, which was established by the 2010 Travel Promotion Act. BrandUSA recognizes the importance of the Russian travel market and is actively promoting travel to the U.S. at MITT. I encourage you to experience all that the U.S. has to offer and make the U.S.A. your next travel destination. Check out the great cities of New York, Chicago, New Orleans, or where my home is now located nearby San Francisco. But also think about going to some less well-known places like Florida, New Mexico, or my home state of Montana. I guarantee that you will never see a more beautiful place than Glacier National Park, located in the northwest of Montana! Find news and information from the park at @GlacierNPS. There is an entire network of travel professionals ready to take you to all of these fantastic destinations. First published in Michael Mcfaul's LiveJournal blog. Read the original. Michael Mcfaul is the U.S. Ambassador in Russia.